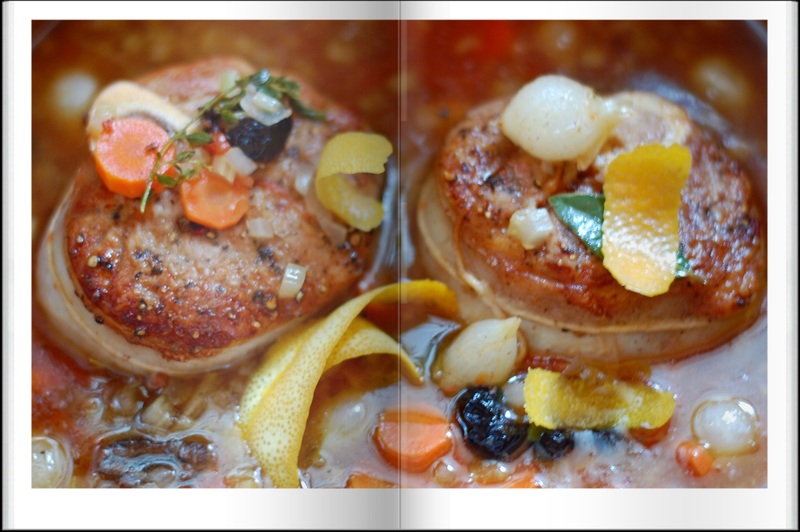 I have even made chicken osso buco style, but nothing beats the real veal shanks…I didn’t come across an Ina recipe, just adapted versions, so below is a copy of my Kindle “Foolproof” version. My photo is a strange book framed version since I tried to get fancy the last time and unfortunately, I trashed the other photos, oh well maybe next time. 3 cups good chicken stock, preferably homemade. Rinse the veal shanks and pat them dry. In a medium bowl, combine the flour with 1 tablespoon salt and 1 ½ teaspoons pepper. Toss the veal shanks in the flour and shake off any excess. In a pot or Dutch oven large enough to hold the veal shanks in one layer, heat 2 tablespoons of olive oil over high heat. In two batches, brown the veal shanks on all sides for about 10 minutes, turning to brown evenly, and place them on a plate. Add more oil, if necessary, to cook the second batch. Wipe out the pot with a paper towel. Melt the butter in the pot, add the celery, carrots, leeks, and onion, and sauté over medium heat for 10 minutes, until tender. Add the garlic and lemon zest and cook for 1 more minute. Add the thyme, wine, chicken stock, 1 tablespoon salt, and 1 ½ teaspoons pepper, scraping the pot to incorporate any browned bits. Return the shanks to the pot and bring the liquid to a simmer. Cover the pot tightly and place in the oven for 1 ¾ to 2 hours, until the veal shanks are very tender. Taste for seasonings and serve the shanks hot with the sauce. Garten, Ina. Barefoot Contessa Foolproof: Recipes You Can Trust (Kindle Locations 1558-1560). Crown Publishing Group. Kindle Edition.